The National Music Auditorium (ANM) is an organisation which forms part of the National Institute of Scenic Arts and Music (Ministry of Education, Culture and Sports). Designed by the architect José María García de Paredes, it was opened on 21 October 1988 and its construction was undertaken as part of the National Auditoriums Programme, aimed at providing the country with an adequate music infrastructure. The ANM is responsible for important activities in the world of music, offering its facilities to both individuals and public or private organisations for the holding of musical events. Its two concert halls,Symphony and Chamber, with 2,324 and 692 seats respectively, allow up to four concerts a day to be held, with afternoon and evening performances. 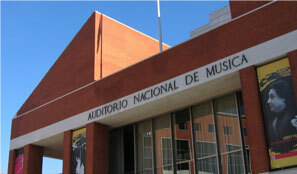 The Spanish National Orchestra and Choir has its headquarters at the ANM. The Auditorium is also the headquarters of the Spanish National Youth Orchestra. Mondary: 4 pm to 6 pm. Tuesday - Friday: 10 am to 5 pm. Saturday: 11 am to 1 pm.